Barack Obama is the most autocratic President we’ve had in the United States since Woodrow Wilson. He doesn’t care what Congress thinks about going to war with Syria and his administration has made it known that it’s planning to bomb no matter how the vote turns out. 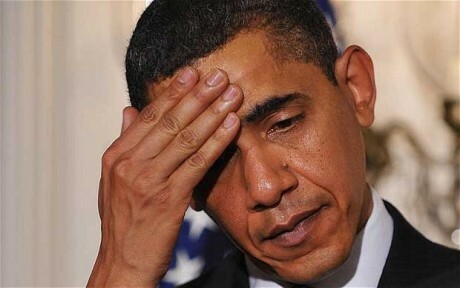 In fact, the only reason Obama is going to Congress at all is because the American people are ferociously opposed to helping Al-Qaeda by bombing Assad and so Obama is hoping to spread the blame around for an unpopular war. Naturally, John McCain, Lindsey Graham, John Boehner and Eric Cantor rushed out to back Obama on a wildly unpopular bombing campaign that their own supporters hate with a passion. If you’ve ever wondered why Republicans get called the “Stupid Party,” that may help explain it. However, not every Republican is quite so dumb. There are quite a few conservatives who think backing an unpopular war that helps Al-Qaeda and isn’t in our national interest probably isn’t so smart. Furthermore, after spending 8 years screaming about a “rush to war” and a “cycle of violence,” there are even a few liberals that are uncomfortable with the idea of bombing Syria to keep Obama from embarrassing himself. Because of that, the pro-war vote tallies aren’t looking so hot in the House. Various news organizations are contacting members of Congress to see where they stand on the attack authorization. While each outlet has different numbers, the ominous sign for the administration is that all of them show the “no” votes outpacing the “yes” votes by a more than a 3-1 margin. Nancy Pelosi has never been particularly concerned about looking hypocritical; so you can expect her to push Democrats very hard to support Obama. The argument won’t have much to do with Syria; it’ll be more like, “It will make Obama look really bad if he loses this; so you have to vote for him!” Unfortunately for Obama, he’s a lame duck who hasn’t done much to build relationships in Congress; so that argument will have less resonance than you’d expect. As to Boehner and Cantor, they’ve made fools of themselves on this issue already and there’ll be no whipping on the vote. What this all adds up to is that win or lose in the Senate, Obama is likely to lose a bipartisan vote in the House on Syria. What happens from there is anyone’s guess although Obama, being Obama, is likely to screw it up.